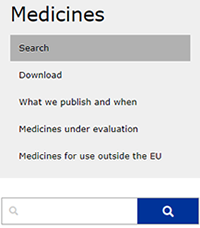 These search tips aim to help you use the European Medicines Agency's (EMA) medicine and global sitewide searches more effectively. The search boxes on EMA's website work by searching the website's content that contain one or more of the words you type in. The sitewide search, which is located on the top of the website, looks for these keywords in all of the website's content. 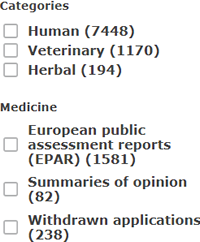 The search box accessible via 'Medicines' in the main menu and the search box within the 'Search for medicines' box on the homepage look more specifically (but not exclusively) within EMA's medicine records. Using connector words, quotation marks and truncation in the keyword search can help make your search more precise. You can also search without using a keyword, with the help of the search filters available on the main search interface. If you are initiating a search via the sitewide search or the 'Search for medicines' box and do not want to use a keyword, just click on the search button next to the search box without typing anything in the box. This will take you to the main search interface where you can start using the filters. Using the search filters is a good way to make your search more precise. When you view the website on a desktop computer, these are on the left of the main search interface. On a smaller screen, such as a mobile device, they are at the top in a collapsible section called 'Refine'. 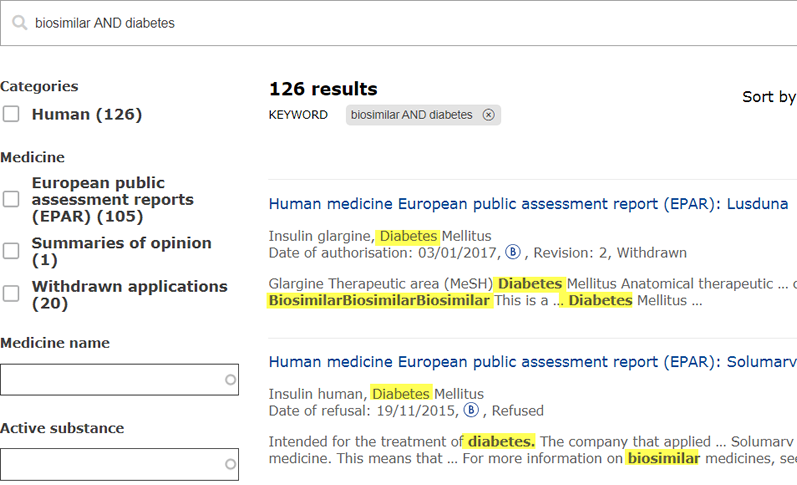 controlled vocabulary filters, allowing you to conduct more precise searches of EMA's medicine records and website content. These filters bring up suggestions as you start typing your search word. If you select one of the suggestions, the results will be limited to content where the search word matches the filter subject. It will not include results where the search word is included somewhere else on a webpage or in a document. For example, if you use the 'active substance' filter instead of the keyword search to look for an active substance, you will retrieve far fewer and more relevant results. news published within a specific timeframe. You can remove filters by clicking the X next to the filter you want to remove or remove all filters by clicking the X next to 'Remove all filters' (see above). Make sure you remove all filters before starting a new search. It can be helpful to use connector words like AND, OR and NOT (in block capitals) between search terms in the keyword search, either to narrow or broaden your set of results. NOT for finding content that does not contain a specific word. If you type NOT between search terms, your results will include items with the first term but not the second. The EMA website's search function automatically assumes the OR between search terms if you do not type anything between them, so the results will contain at least one of the words you’re searching for. Using truncation saves time, as you can find results with similar terms in one search rather than several, by adding an asterisk (*) to the end of a root word. If the word you are searching for needs to be considered as a whole word, enclose it in quotation marks, e.g. “keyword”. This will avoid finding similar terms or derived words. You can also use quotation marks to search for a specific string of words. For example, by searching for "good manufacturing practice", you retrieve results where all of these words are contained together in sequence. If you search for the same three words without the quotation marks, your results will include content containing at least one but not necessarily more than one of these words. EMA's search sorts results by relevance by default. Relevance is based on the frequency with which your search words appear in the titles and content of results along with other factors, such as relative importance of the content and where matches were found within the content. If this does not suit your needs, you have other options. You can sort your results by publication date, medicine name, authorisation date, date of opinion, active substance name and event date. If you have too many results to be able to sort them, use the filtering options on the left of the results page or add additional search words to reduce their number. Please also note that the sorting options may not all work for your specific set of results. 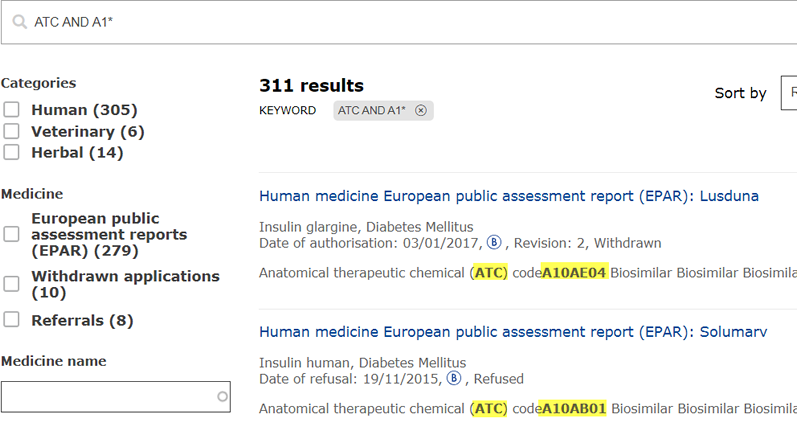 If your results include events or news for example, you will not be able to sort these by medicine name or active substance name. You can download medicine-related data published on this website in Excel table format from our Download medicine data page. These tables, which are updated daily, also allow you to sort the data in different ways. Only medicines evaluated by EMA are available on this website. Information on medicines authorised in individual Member States through national procedures can only be obtained through the national competent authorities. You may not be able to obtain a complete list of available treatment options for a specific condition by searching on EMA's website.